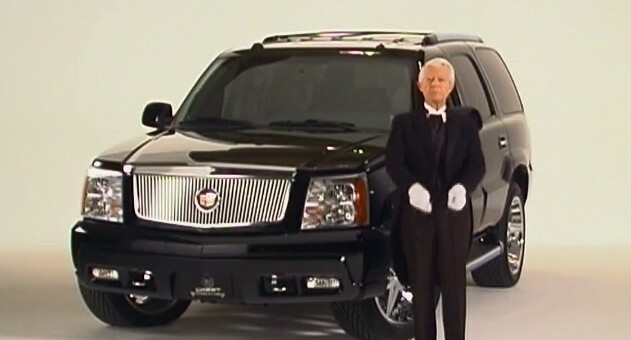 Somehow, the polished butler and seemingly educated accent seem to fit the Cadillac brand image — wouldn’t you say? And if nothing else, the ad is unique — although we thought it to be pretty good overall. Hat tip to Dan D.
Fake English accent and bling. C’mon! What the hell was that? The yanks have an upper class; get someone from there to do a VO for an ad highlighting the ATS and CTS, not 10 year old used Escalades. American luxury car marque that’s doing its best to be European. It’s an ad for a pre-owned car, so the last-gen Escalades fit — especially given how in demand they are on the second hand market. Plus, butlers and the English accent have thoroughly been known as hallmarks of luxury… it fits. Thanks for the heads up Joe; fixed and updated.